What Is a Low Profile Bottle Jack? When it comes to lifting tools it is tough to find one that packs more force in a small package than a bottle jack. 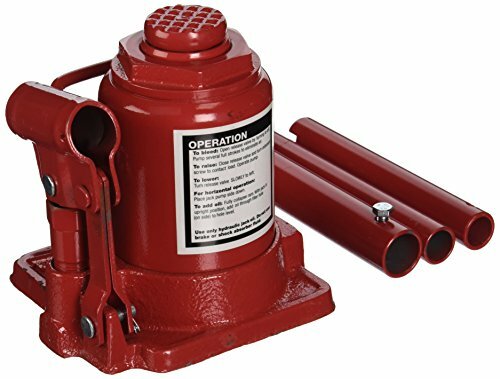 These hydraulic wonders allow you to turn small and relatively easy lever movements into tons of upward force, and are great for lifting a car, camper, or even jacking up a cabin or porch for home improvement projects. Of course, they are never going to be as good as a garage lift when it comes to working under a vehicle. But then again, you can’t store a garage lift in your trunk in case you have a flat. But while most bottle jacks are relatively short – roughly a foot or so in height – sometimes you face lifting jobs with less headroom. In times like those a low profile hydraulic bottle jack is the right tool for the job. 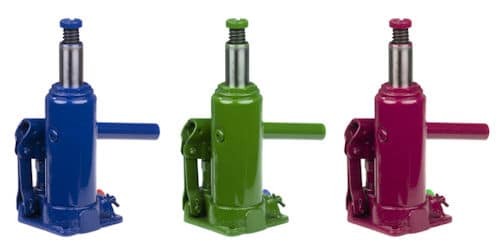 Click the buttons above for detailed information about each unit, or read on for our review of each of the top 3 low profile bottle jacks. Our top choice for the best product in this review is the Goplus 20-Ton Hydraulic Bottle Jack. As the name implies, this powerful little jack packs in 40,000 pounds of lifting force in a little over seven inches of height. In our opinion, a 20 ton bottle jack that is just over half a foot tall is very impressive. It includes features like all steel construction, an enamel finish to fight corrosion, an adjustable screw for additional lift height, a hardened plunger, and a 2-piece pump handle that allows for compact storage. That makes it the perfect little jack to keep in your vehicle for roadside emergencies, even if your vehicle is a large motor home. A survey of online reviews of the Goplus 20 ton low profile jack show a high level of satisfaction from buyers. The Goplus offers amazing lifting power in a very compact package, and can be had at a great price. It is everything you want in a low profile heavy duty bottle jack, which is why we made it our top choice. 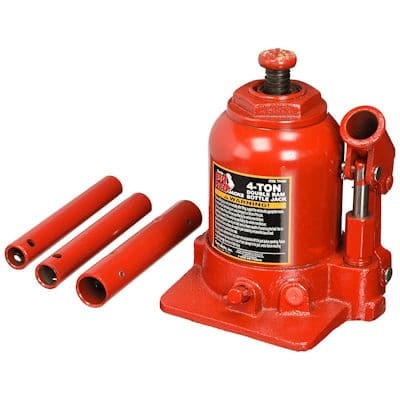 【Durable Material】This hydraulic jack is all-steel construction, very sturdy and safe when use. With the hydraulic steel cylinder unit, it results in lower oil pressure needed to raise the load, which helps to reduce wear and extend service life. 【Adjustable Height】With heat treated extension screws, this bottle jack allows to adjust the lifting height. The maximum lifting height is 14-1/4-Inch (36 cm), which will meet most people's needs. 【High Quality Paint】It is painted with red glossy anti-rust and corrosion-resistant paint, which can be used both indoors and outdoors. And because of this feature, it is also very easy for you to clean. 【Easy to Assemble and Use】All assembly hardware and parts are included. Clear and brief instruction make it much easier to put together. With two-piece pump handle, it makes for easy use in tight spaces and compact storage. 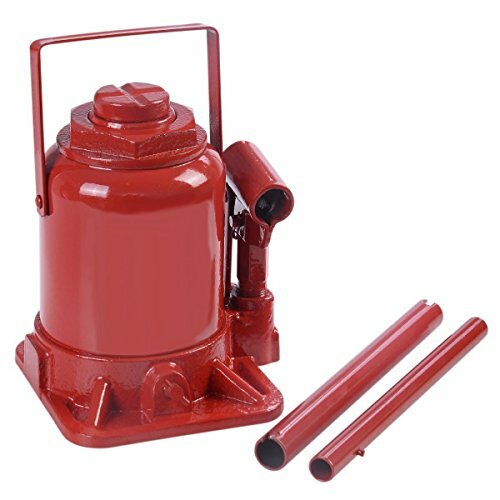 【Multifunctional Use】It features a high quality glide action pressure pump, it is easy to lift farm vehicles, heavy-duty machinery, industrial construction equipment and other hard-hitting commercial uses. Our second choice in this roundup of low profile bottle jacks is the Sunex 4913A. This little jack has less lifting power than the Goplus, but still hoists a respectable 12 tons. That makes it perfect for use with heavy duty trucks, farming equipment, mobile home leveling, and building construction projects. And it packs all that power into a package less than 7 inches tall. The Sunex 4913A features a ductile iron base to give it additional strength, as well as a heat treated extension screw. It also features electrostatic paint to ward off corrosion, and also has a grab handle to make it easier to carry. People who have purchased the Sunex 4913A mostly have good things to say about their experiences with it, with over 80% giving it 4 or 5 stars. A few did mention they wished it extended a little higher, but that is a common issue with many low profile bottle jacks. And given the extremely competitive price, the Sunex 4913A is a solid contender. The third item in our review of the top low-profile bottle jacks is the Torin Big Red TF0402. The TF0402 features dual-stage, steel hardened rams that allow for both higher lifting height and a lower height while retracted. And it comes with a wide, rugged base that provides both stability and strength. The 4-ton lifting capacity of the Torin Big Red is significantly less than our top competitors, but still offers more than enough strength for raising most passenger vehicles. Three quarters of the online reviewers of the TF0402 gave it either 4 or 5 stars, so it is a well regarded unit. But a few reviewers did mention that they had problems with oil leakage after a few uses, others wished it came with a carrying handle like our top 2 units. But the overall positive feedback from purchasers and reasonable price makes the Torin TF0402 4 ton jack worth considering. There are multiple types of low profile bottle jack options on the market, and they all have specific uses. A jack used in the incorrect manner can result in injury or death. The bottle jack, also known as the “whiskey jack,” is a jack that is shaped like a bottle. This jack is used in order to lift incredibly heavy loads straight up into the air. The low-profile bottle jack is lower to the ground and features a wider base than a standard bottle jack. This allows the low-profile bottle jack to lift heavier loads than a regular bottle jack, which is useful when using the jack on a large structure such as a building. Different types of low-profile bottle jacks are equipped to lift various amounts of weight, with the strongest being able to lift up to 50 tons. It is strongly recommended that a bottle jack not be used in order to raise a vehicle for maintenance, but rather for purposes such as painting. This has to do with the way in which the low-profile bottle jack raises, as opposed to a jack created specifically for automobile repair. An auto jack comes equipped with wheels in order to compensate for the arc trajectory that a car follows when it is being jacked up. This allows for the jack to get a sturdier grip on the car and better ensure user safety. Cars are more likely to fall off a bottle jack, even a low-profile one, because these devices lift the weight straight up into the air. It is advised to never go underneath a car with any body part, whether just one’s head or the entire torso, especially when a car is incorrectly lifted on a low-profile body jack, as the car may be unstable and cause injury or death. Low-profile bottle jacks are more typically used to lift structures straight up into the air for items that cannot safely balance on one side to support the side not being jacked up. Multiple low-profile bottle jacks can be set up to raise a building for maintenance or construction. They are also used to lift stationary equipment in addition to serving as temporary structural support. If you do use a bottle jack to lift a vehicle, be sure to use jack stands to hold the vehicle after it is raised to prevent injury. As stated earlier, a low-profile bottle jack looks like a short, wide bottle. This part is placed underneath the structure or piece of equipment that needs to be lifted. Bottle jacks can be either hydraulic or work by screw. 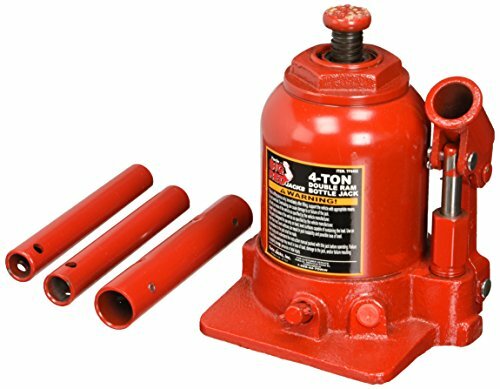 The hydraulic jacks are capable of lifting heavier weights because they do not have to be lifted manually. On the top of a low-profile bottle jack is a lifting ram that pushes the object being lifted up vertically. This ram is typically equipped with a support pad at the top that prevents the object being lifted from falling off. 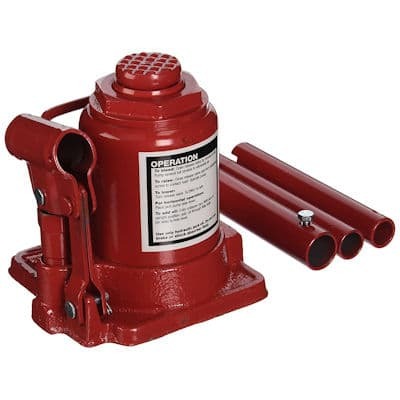 These jacks are capable of lifting incredibly heavy loads straight up into the air and holding them there so that the objects or equipment being lifted can be maintained, constructed upon, etc.